Attended school in Leicester. Entered Methodist Ministry in 1915 and served in the First World War as a 2nd Lieutenant. After the Armistice with Turkey, he became Chaplain to the Devonshire Regiment. 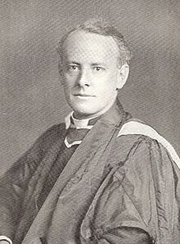 In 1919 he took charge of the English Methodist Church in Madras, returning to England in 1922 when he was appointed to the Manchester (Oxford Road) Methodist Circuit. From 1925-1936 he served in the Leeds (Brunswick) Circuit. From 1936 to his retirement in 1960 he was minister at the City Temple, London, where his renowned preaching drew crowded congregations. He served as President of the Methodist Conference, 1955-1956. He retired to Bexhill-on-Sea. He was married to Evelyn, who predeceased him, and he had a daughter and two sons. Leslie D. Weatherhead is currently considered a "single author." If one or more works are by a distinct, homonymous authors, go ahead and split the author. Leslie D. Weatherhead is composed of 10 names. You can examine and separate out names.